ATR, the equal partnership between Airbus and Leonardo, will use the Farnborough International Airshow to display its all-new ATR 42-600 in the livery of its U.S. launch customer, Silver Airways. The plane, which will be leased from Nordic Aviation Capital, will be open to inspection of attendees to the airshow. Silver Airways was founded in 2011 and is headquartered at the Fort Lauderdale-Hollywood International Airport. It operates around 170 daily scheduled flights to ten cities in Florida, while also serving eight destinations in the Bahamas, from its three hubs at Fort Lauderdale, Orlando and Tampa. Its fleet of 22 Saab 340Bs is now being augmented with ATR Family aircraft, with orders for 15 46-seat ATR 42-600s and four 70-seat ATR 72-600s, which are all scheduled for delivery between 2018 and 2020. Hawaiian Airlines has posted its system-wide traffic statistics for the month of June. Hawaiian welcomed more than 1.04 million guests in June 2018, an increase of 2.9% over the same period last year. Total traffic increased 4.6% on an increase of 4.3% in capacity. The load factor increased 0.2 points to 87.8%. 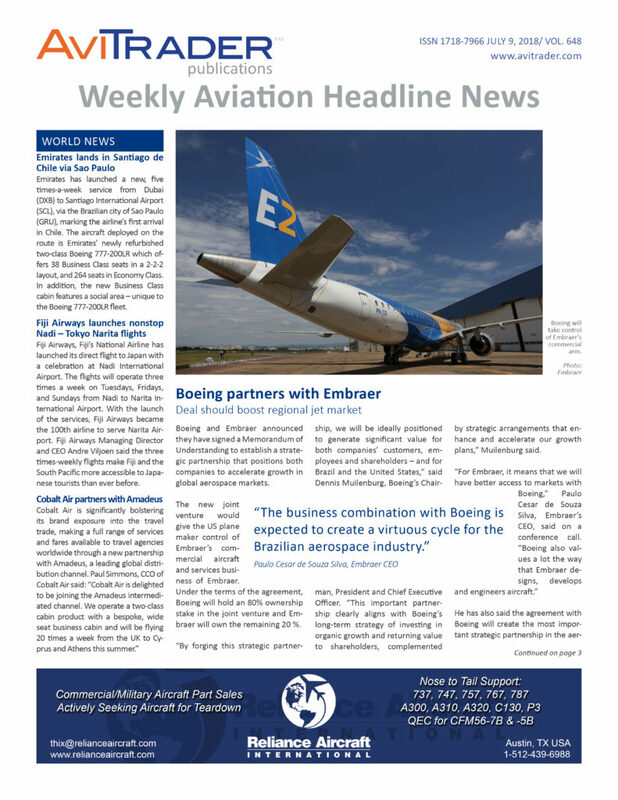 EngineStands24, Magnetic MRO’s sub-brand providing online solutions for engine stand lease and sales, continues to expand its selection of certified stands for the most common aircraft engine types, following signing an agreement with Rhinestahl CTS; the manufacturer of LEAP engine stands. HAECO ITM, a member of the HAECO Group, has selected Ramco Systems (Ramc”) – provider of the Ramco Aviation Suite of software – to support the company’s IT operations. Ramco Aviation Suite will integrate with HAECO’s existing business systems, while the partnership will also enable HAECO ITM to interface with customers and suppliers through Aeroxchange. 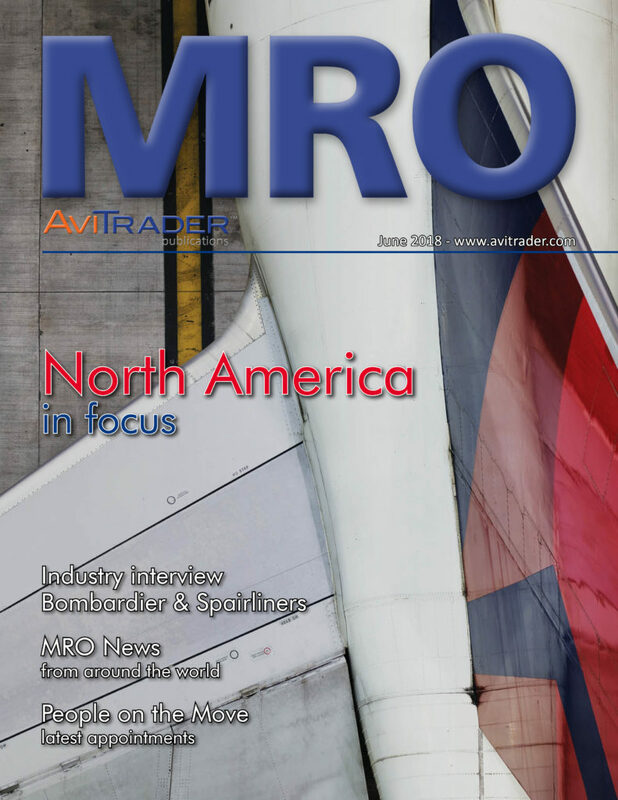 Aeroxchange is the only electronic business network that supports all MRO business processes within the aviation industry for buyers and sellers. JetBlue has become the first customer for the newly-rebranded Airbus A220 aircraft, signing a Memorandum of Understanding for 60 firm orders for the larger A220-300 model. In addition, the airline converted 25 of its current orders for Airbus A320neo aircraft into orders for the larger A321neo. JetBlue’s A321neos and A220s will be powered by Pratt & Whitney GTF engines. AAR's OEM Aftermarket Solutions group has signed an agreement with LORD Corporation to be its channel to the Americas market for LORD Flight Control Equipment repairs. The LORD products covered by this agreement are cockpit controls for systems on Airbus commercial fixed-wing aircraft. LORD acquired LORD Electromechanical Solutions (formerly Fly-by-Wire Systems France) from SKF in June 2016 and established a U.S.-based repair station for the products in August 2017. AAR will manage customer repairs going into LORD’s Cambridge Springs, Pa., facility. The Norwegian Air Shuttle Group and Lufthansa Technik have signed a Memorandum of Understanding to early extend an existing Total Engine Support (TES®) contract with Lufthansa Technik. The agreement covers all-inclusive services for the CFM56-7B engines powering the airline's current fleet of 115 Boeing 737-800 aircraft. According to the MoU, Lufthansa Technik will cover all planned and unplanned shop visits for the next five years at its highly dedicated CFM56 engine shop in Hamburg, Germany. The extended agreement will also cover a far-reaching engine lease management. Lufthansa Technik will secure the leasing of spare engines for Norwegian to ensure the availability during peak overhaul periods. The contract will also include the regular employment of Lufthansa Technik's proprietary Cyclean® Engine Wash and on-site services such as the use of the portable device aerotracer. Lufthansa Technik has been maintaining Norwegian's CFM56-7B engines since the fleet introduction of the Boeing 737-800 in 2008. In addition to the current engine agreement, Lufthansa Technik also supports the 737-800 fleet of the Norwegian Group with a range of other services, including extensive airframe maintenance. West Star Aviation has reported that the Agência Nacional de Aviação Civil (ANAC), the Brazilian civil aviation authority, has approved West Star's East Alton (ALN) facility to work on Brazilian registered aircraft through 2020. This approval is the latest addition to a growing list of authorizations which have allowed West Star to expand business worldwide. West Star will now offer full-service maintenance, installation, inspections and repairs on Brazilian registered aircraft beginning June 2018. StandardAero, in partnership with California-based MRO ACI Jet, has certified another Honeywell JetWaveTM Ka-band satellite communication system, completing a Supplemental Type Certificate (STC) for installations on Bombardier Global Express, Global 5000 and Global 6000 Aircraft. Honeywell’s JetWave system is a popular offering in the world of in-flight connectivity, utilizing Ka-band technology to replicate the speed and performance that consumers are accustomed to in their homes. StandardAero’s STC provides for installation of the Honeywell JetWave hardware, under a Honeywell Ka radome, along with a Honeywell CNX-900 router. StandardAero partnered with ACI Jet in San Luis Obispo, CA, to complete the installation.